and provide features you don’t get with other PBX phone systems. From 1 to 100 extensions, we have you covered. Our exceptional customer service is our primary driving force. It is the reason we started the company. Our hosted VoIP service is packed with features. Other systems charge for every extra option. Big Fish Voice is a hosted virtual business phone service provider providing high quality reliable phone service to residential and small business customers. As a small business customer, you have all the features of traditional business telephone systems and more without the capital expense. Our residential customers, have a full spectrum of features available with the reliability of a business phone system. We’ve saved thousands of dollars and the phones have been great. They’ve been very easy to use. The voicemail is very easy to access and we like the system and Big Fish service a lot. It has been great and whenever we have extra needs like this remote access, their guys have been able to meet our needs. Big Fish Voice has been a big blessing to Providence Community School. We find that working with a local company has huge benefits. We’ve also found that with the features associated with the technologies they use we are able to quickly and easily access the information that we need even when we’re not here on campus which for us, being here two days a week and being at home three days a week is a big benefit. 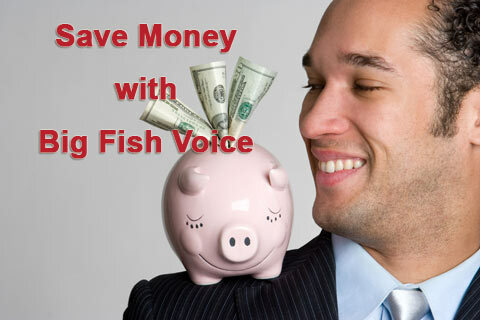 Big Fish Voice was an incredible financial advantage for us. We were able to shave a hundred dollars a month off of our telephone bill by switching over. Moving to Big Fish, we were able to do a seamless transition. We like that we have the client portal as well so we can record all of our activity coming in. There’s a lot of reporting aspects that we have within the portal so that’s nice as well. They stay on top of everything and I will say that of course Big Fish being a locally based provider to our central office we are able to get quick response to our requests. We are confident that we are able to improve you call quality at the same time reducing your monthly phone bill. Many clients save over 50% or more on their monthly phone service. This savings typically pays for their startup costs in a few months. Complete the form to the right and we'll be in contact with you to give you a FREE no obiligation quote.